ERA Architects designed the offices for law firm Moroglu Arseven located in Istanbul, Turkey. 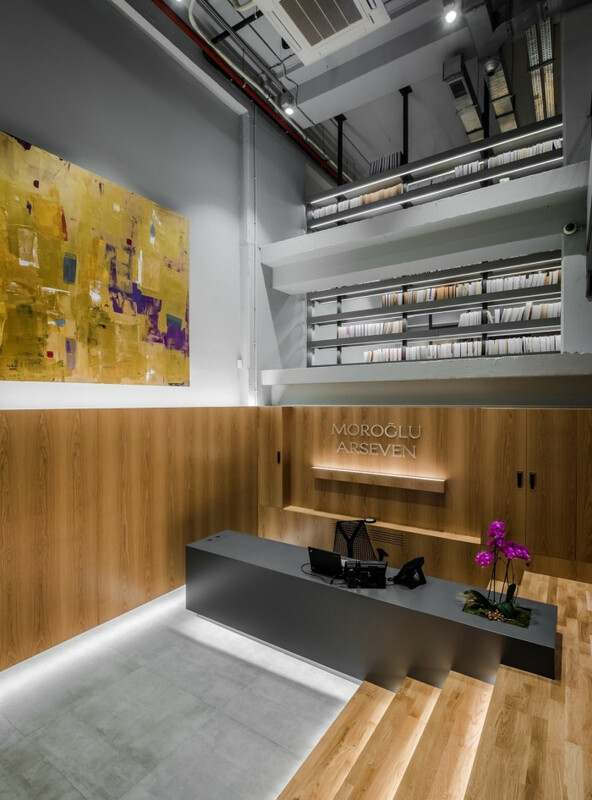 Moroglu Arseven Law Office is located within the extension of an eight-story building in the Nisantasi district of Istanbul. The extension is a simple reinforced concrete carcass structure constructed for an automatic multi-story car park system, that ceased to function after a period. During the design of the refurbishment process, we see the existing structure as a starting point of the project rather than a restraint. This structure, which we cannot change its structural elements, served as a template to place functions into. In many fit-out projects, corporate identities of clients are reflected on the surfaces of the spaces, with either indirect or direct analogy. In this project, we did not have such a request from our employer, and as a project team, we were particularly concerned to avoid using cliché visual metaphors. Instead, universal law principles, such as equality, openness, simplicity, honesty and power, have guided us conceptually. The existing structure was used as a template reminiscent of the strength of the rough and solid nature of the law. We did not want to cover the beam, column and ceiling surfaces because taming such a brutal structure by covering its surfaces and adorning with delicate details would be against our concept. We used all the essential infrastructure, such as AC channels, lighting and electrical wiring, in an honest and simple manner without the need to cover them. Moroglu Arseven Law office is working as a is a six-story vertical office with three main floors and three mezzanines in this re-purposed structure. The project has been designed to create a sense of travel which has different intensities of usage in each floor starting from the ground level and climbing upwards. The library and meeting areas connected to the reception are the main functions of the ground floor. The most important structural intervention in the existing building was vertical circulation, which established the main communication link between the floors. We aimed to create an office atmosphere where employees could easily focus and socialize at the same time with the use of plain furniture and neutral colors.